It has really been that long since Patek Philippe has been about. With their amazing ability to create, design and think-up ingenious and sublime timepieces they have taken over the World! Maybe it is a bit of an exaggeration but it is not far off at all. To most fans of watches, there is at least one Patek Philippe that would be in their ‘Ultimate Collection’, mine would be the 5140 Grand Complication. It’s simplicity and unassuming size not mentioning the fit and finish are it’s finest qualities and what attracts me to it the most. But enough about that for the moment. A couple of weeks ago at the end of October Patek held a celebratory event in Switzerland. With the usual fanfare and buzz around such events a collection of watches were released specifically to commemorate the 175th Anniversary. Patek Philippe’s 175th anniversary is celebrated with the creation of limited-edition commemorative pieces. 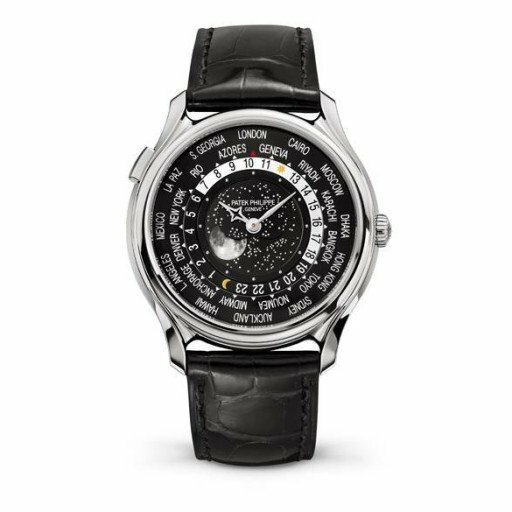 The star of the collection is the Patek Philippe Grandmaster Chime, a wristwatch with 20 complications. This thing is a monstrosity in it’s technical brilliance and what has been achieved on it, though it is probably not the watch that is most attractive in the entire collection. For me that has to be the reference 5575G-001. Some of my peers have referred to it has impossible to read and too cluttered. I beg to differ. Featured within a ‘just under’ 40mm white gold case, well 39.8mm to be exact is the Caliber 240 HU LU which consists of 270 parts. It is a mechanical self-winding movement with a micro-rotor detailing a central moon phase and 24 hour time zones. Not to mention a day night indicator too. It is a lot with so few parts. The dial on the outer ring shows the city, with the marked exception of Geneva which has replaced Paris as the usual timezone city. A smaller inside ring shows the time at the specified location in 24 hour format, and the central dial has a moon phase indicator in it. You will also notice the interestingly shaped hour hand, shaped like a star. So that you do not forget that this piece is an anniversary piece the clasp is engraved with Patek Philippe 1839-2014 and the Patek icon that is the Calatrava cross. Even the caseback has an engraving on it, this time saying ‘Patek Philippe 175e Anniversaire 1839-2014.’ After all of these additional embellishments, the watch is still water resistant to 30m, though why you would swim with this watch at all baffles me. Limited to 1300 pieces and available for 46,000 CHF. It does smack a little bit of desperation due to all the engravings and the constant reminders that it is a 175th Anniversary edition, the issue is potentially it being more commercial much like Panerai and their numerous Limited Editions. But Patek being Patek have done it rather tastefully, this watch will definitely be sought after. That is if it hasn’t already sold out!! !